For people who just want a basic Android tablet, the Fujitsu STYLISTIC M532 might be overkill. 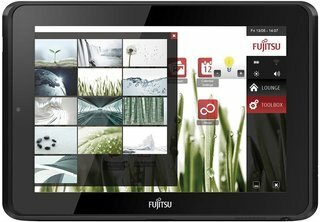 It’s a great tablet for both business use and pleasure, but Fujitsu designed the M532 with a harsh environment in mind. The tablet is designed to stand up to more abuse, and that earns a higher price. Most high-end Android tablets cost close to $500 and this one checks in at $549, slightly higher than average. A tablet like this is a good fit for truckers who could really use a well-made piece of hardware for using as they load and unload. For workers in the field or users folks who habitually break their tablets, that extra $50 is a bargain compared to buying a replacement tablet. This isn’t a Mobile Demand rugged tablet that the user can run over with their delivery van or chuck off a third story balcony, but it should withstand a little more punishment than most tablets. For that purpose it’s a real value even at the higher price. There’s nothing wrong with the M532; it’s a fast performer with some useful features and decent software. However, it doesn’t have anything special to put it above the competition. The Fujitsu Stylistic M532 is a very solid business tablet option, despite being an imperfect device. There are a few flaws that counter some of its greatest strengths, including the way the powerful and otherwise efficient processor randomly gets gummed up every now and then, and how the MIL-STD toughness may protect it from the elements, but not so much from physical trauma. But beyond that, the M532 is well-equipped to serve enterprise audiences, with great security features, a sleek, easy to carry form factor, capable hardware, and virtually no preloaded bloatware to clutter up the machine. It may be a little on the expensive side, what with a starting price of $549.00, but on the other hand, that's no worse than the new iPad; all models except the 16 GB Wi-Fi model ($499) are more expensive than the M532 and it's found plenty of success in the enterprise market. So if you're finding that your current Android business tablet is becoming a little outdated and you're looking for a refresh -- or even if you're looking to invest in one for the first time -- the Stylistic M532 is one of your best bets. The Fujitsu Stylistic M532 is a niche Android tablet that will appeal to businesses looking for extra durability and security features. The display is also plenty bright, and we like the soft-touch finish on the back. However, this slate falls short of competing consumer-oriented tablets in terms of screen resolution, volume and, most important, battery life. While the M532 delivered decent performance and accurate audio, we prefer the ASUS Transformer Infinity Pad, which boasts a whopping 1920 x 1200 resolution, better performance and longer endurance for $50 less. But Fujitsu deserves credit for addressing a market not served by the majority of Android tablet makers. The Fujitsu Stylistic M532 MSRP is about $550, which is roughly the initial going rate for a 10” tablet with 32GB of internal memory and SIM card slot for data. It, however, adds a military standard toughness to the mix, so you can be comfortable with more abuse and neglect than your average Android slate. The Asus Transformer Pad TF300 and Samsung Galaxy Tab 2 (10.1), offer similar specs in this price range, but are not as rugged, and Fujitsu’s design is on top of that thinner, lighter and more appealing than both. The Asus slate allows you to hook up USB peripherals to the tablet, though, whereas the microUSB port with the Stylistic is only for data transfer. However, there is a big elephant in the room, called the new iPad, which comes more expensive with the cellular connectivity, but will offer that “Resolutionary” display no other tablet is even close to matching, plus a cool aluminum chassis. If you are fine with standard display resolution, you can get the 32GB iPad 2 in 3G flavor for about the same money as the Fujitsu Stylistic M532, and have an abundance of slicker tablet-tailored apps at your disposal. 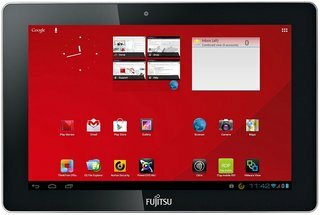 The things that make the Fujitsu Android tablet stand out are its comparative ruggedness in a slim, light and comfortable to hold red-accent design, plus the useful set of licensed enterprise-friendly apps. The market will decide whether these are enough to battle the rest of the Android crowd in this day and age of $200 7-inchers, and $350 10” tablets. On balance we find it hard to recommend the Fujitsu Stylistic M532, but at the same time there isn’t anything about it that is particularly damning. It’ll perform as well as the rest of the Tegra 3 powered crowd, but at around £400-£500 it seems like a lot of money for something quite average in many other respects. The display is particularly bothersome at this price point when you consider the cost of a 16GB iPad 3 with a Retina display. Fujitsu's Stylistic M532 looks smart, and is light for a 10.1in. tablet. It comes with a good range of preinstalled business software, although there's nothing you can't obtain easily for any other Android tablet. The lack of support for USB devices — storage or mouse/keyboard — is a missed opportunity. It's also a pity that you can't charge via USB: by forcing you to use the proprietary dock connector, which is hardwired to the power cable, Fujitsu effectively requires you to carry a special charge cable for this device. Despite these niggles, we think Fujitsu has made an admirable job of producing a tablet that's equally usable in the office and at home. Overall, the Stylistic Q550 is a decent attempt to offer a compact tablet with full Windows compatibility. Its performance is only on a par with a netbook, but its security features and compatibility with enterprise management infrastructure should have some appeal for large organisations. The Q550 makes a lot of compromises and they may not be the right ones for you. You get business security features and full-size ports in compact but sturdy package - but not the full power to go with them. Although it doesn't compete with the price of Android tablets or the iPad, it's one of the cheapest Windows tablets with both pen and touchscreen interfaces. Unfortunately, keeping the price down means it's short on memory and storage. Performance is the real problem here; the Atom Z series was promised as the right chip for tablets with full features and good battery life and here it only delivers the reasonable battery life. Visit the Fujitsu Q&A Forum to get answers, ask a question or help others.